Lounging under the watchful gaze of a beaming sun is one of the simplest pleasures in life. Lying in a comfy chair as the warm rays on sunshine wash over you is the definition of bliss. However, your lounge chair will quickly become uncomfortable or unattractive if you do not choose the right kind of fabric for your outdoor cushions and furniture. You want a fabric that can withstand the elements, won’t fade in the sunshine, provides comfort, and looks beautiful. So what is the best fabric for outdoor cushions? Textilene fabric is a unique fabric, consisting of woven polyester with an outer coating of PVC. This tough and durable fabric is water resistant and is fade resistant, meaning it can withstand rain and sunshine and still keep its appearance. Used primarily for outdoor furniture, sun shades, and sling seating, textilene fabric is also resistant to the effects of mold and is flame retardant. 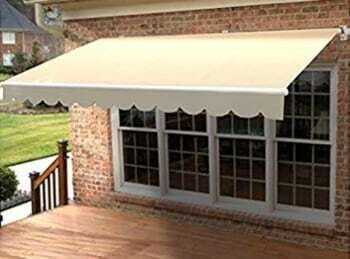 A gorgeous line of durable, low-maintenance awning fabric designed specifically for shade applications that are difficult to maintain. This innovative, self-cleaning fabric features a unique coating that breaks down dirt and organic material so they can be quickly and easily washed away with water. Unlike standard fabric, Shade Fabric has a durable polyurethane coating which will wet out the surface rather than beading up, a characteristic of the fabric’s unique anti-streaking technology. 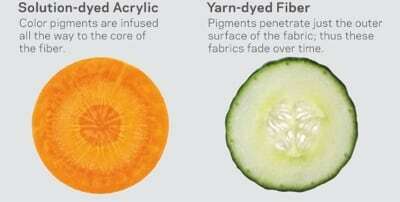 Solution-dyed acrylic fabrics are synthetic fabrics made from acrylic fibers. Known for their high-performance, solution-dyed acrylic fabrics are able to handle a large amount of moisture and mildew without damaging the fabric. The fabric is water repellant, and also look great with colors dyed into them, keeping their color longer because of the complicated dying process. The combination of comfort, color, and durability makes solution-dyed acrylic fabric a great choice for any outdoor cushion. If you’re looking for the highest quality outdoor cushion fabrics, look no further than Westend Cushions and Umbrellas. 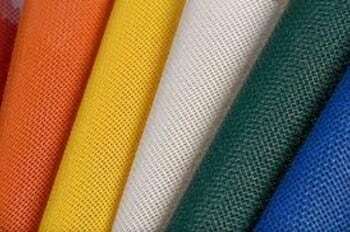 We carry solution dyed acrylic fabric from Sunbrella, Outdura, and Tempotest which are the leading manufacturer of beautiful and functional fabrics. We also carry an array of different designs and colors, ensuring that you will find the perfect fabric that will fit your outdoor patio furniture. If you are interested in learning more, come visit Westend Cushions and Umbrellas at our location in Hemet, California, or give us a call at (951) 925-6015.